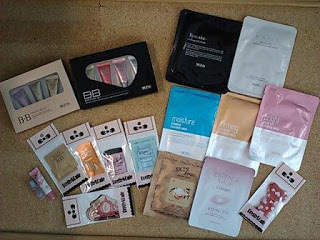 Skin 79 Moisture Ceramide Essential Mask was part of my PrettyAndCute haul. I tried this mask last night, after cleaning and exfoliating my face. I tried to get a photo of the package, but it was so reflective that I couldn't get a good one. The mask comes out of the pouch very wet, and to me it smells like clean laundry. I thought it was a pleasant scent, and it was not a heavy smell, so it didn't give me a headache like some heavy fragrances can. Like the other Skin79 mask I tried, it fit my face well for the most part. I gave myself more eye room by snipping the outer corners of the eye holes. That also allowed the mask to lay flat on my face around my eyes. The nose piece was still a bit too small, and the mouth hole was a bit small, as, overall, these were made to fit a more petite face. You are supposed leave the mask on your face for 10-15 minutes. I left the mask on for about 20 minutes, as I got distracted by surfing my blog reading list. There was a very pleasant sensation of my skin getting moisturized, and a neutral sensation of something cold and wet on my face. After the 20 minutes, I removed the mask and patted my skin to work in the fluid left on my face, as the directions instruct. There was a lot of moisture from the mask left on my face. Once dry, there was no filmy or sticky feeling. My skin felt soft and smooth. I noticed that the mask, which was intact when I put it on my face, now had tiny holes in the fabric. It looked like these holes corresponded to areas where my skin was especially dry and perhaps had sucked out all the moisture/product from the mask. Visually, I don't see a difference in my skin, other than I didn't need to put on my nightly moisturizer. It does, however, feel very smooth and soft after application. By the next morning, I feel the performance of this mask is mostly equivalent to my usual nightly moisturizer. But, it feels nice, and there is something special about doing a facial treatment that can be seen by family members. For me, it means that my husband chuckles at the silliness, and my little ones blink, eyes wide, before retreating away to tell Daddy that something weird is on Mama's face. All of that adds up to 20 minutes of alone time. Totally worth it. Have you tried this mask? What did you think of it?